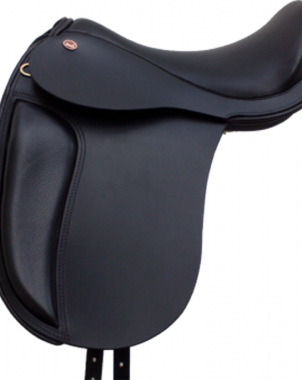 The Strada Dressage Saddle’s unique design offers the closest possible connection between horse and rider. It is the result of many years of painstaking research into the bio-mechanics of horses and riders. Flexible tree that uses no metal components and is designed to distribute weight evenly. Tree and panel design allow the horse to move freely throughout the entire range of movements, without creating pressure points that hinder muscular development and performance. 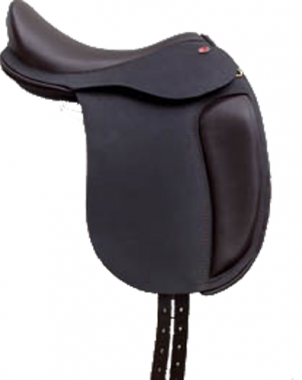 Seat & flap design, as well as stirrup bar placement, permit the rider to sit naturally and apply the aids easily and effectively. 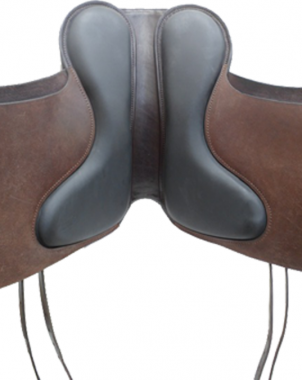 The saddle sits very close to and “around”, rather than “on” the horse, resulting in superior stability, particularly on wider horses. There is no need for the girth to be very tight. The rider can really feel the horse, rather than just the saddle. The all-important weight aids are readily transmitted to the horse.